I woke this morning (strictly speaking, yesterday morning), opened my eyes, looked out of the window and the sky was a deep blue with nary a cloud in sight. I waited patiently until I thought the roads would have dried out somewhat before heading off into the wild blue yonder. 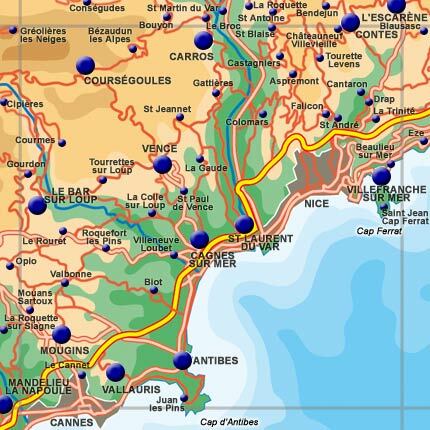 Actually, it was only up to Vence but it was just so heavenly to be out on my bike, in the sunshine, with my beloved. I was keen to see whether or not I had managed to maintain my excellent pre-monsoon form. I had. I recorded another “best ever” time for my ascent. There were surprisingly few cyclists out enjoying the road. Where was everybody? Most clubs, ours included, have club rides on Tuesdays and Thursdays. Maybe they were saving themselves for tomorrow’s Bank Holiday ride. In any event, my beloved and I had a most enjoyable time, a taster for tomorrow’s main course. I’m keen to profit from these next few days of fine weather and log plenty of kilometres as Sunday we have the twice postponed club pointage, which will be taking place down on the seafront, where I’ll be on duty. I have spent this week replenishing my stocks so that we can offer a good mix of bought and home-made cakes to the hordes of cyclists. No need to provide anything savoury, just biscuits, cakes, chocolate, dried fruit plus hot and cold beverages. We’re anticipating in excess of 500 riders; that’s a lot of cake. I’ve also discovered that they eat more if you provide home-made cake. They feel it’s incumbent upon them to pass knowledgable judgement on my baked goodies. This means the volunteers manning the refreshments table have to eke out the home-made cakes to give everyone a fair crack of the whip, otherwise they’re the first to be eaten. I have made my usual selection of crowd pleasers (pain d’epice, banana cake, fruit cake) plus a couple of new offerings (date loaf, flapjacks, lemon drizzle cake) which have already found favour with my English class. After Sunday the cupboard will be bare but I’ll have to quickly re-stock for the Telethon (charity) ride on the first Saturday in December. I am hoping to persuade one of the other wives to take responsibility for this thereby enabling me to participate in the ride. It’s quite a spectacle and I missed taking part last year thanks to a bad cold. I’m already thinking about tomorrow’s/today’s ride. Where shall I go? I could do with riding the last part of the amended longer Kivilev course to check my Google map calculations for the revised mileage and amount of climbing. I don’t need to ride the entire parcours, just the bit that’s changed. I am hoping that my beloved will ride with his clubmates leaving me to go when, where and for as long as I want. When he’s home we tend to do everything pretty much according to his timetable. He’s fast asleep in bed attempting to rouse the dead with his snoring. I’ve asked him nicely to stop snoring. It hasn’t worked so I’m trying to tire myself out on my laptop. If this fails, I shall turn to yet another of my recent book purchases. I find that nothing sends me off to the land of nod quicker than reading, except maybe some soothing music but I can’t enjoy either of these in the bedroom. I think the Queen may be onto something with separate bedrooms. Ours is big enough to split in two. I would however have to sound proof my half otherwise it would defeat its intended purpose. The snoring has abated somewhat, he must have rolled over onto his side. Maybe, I’ll venture back.